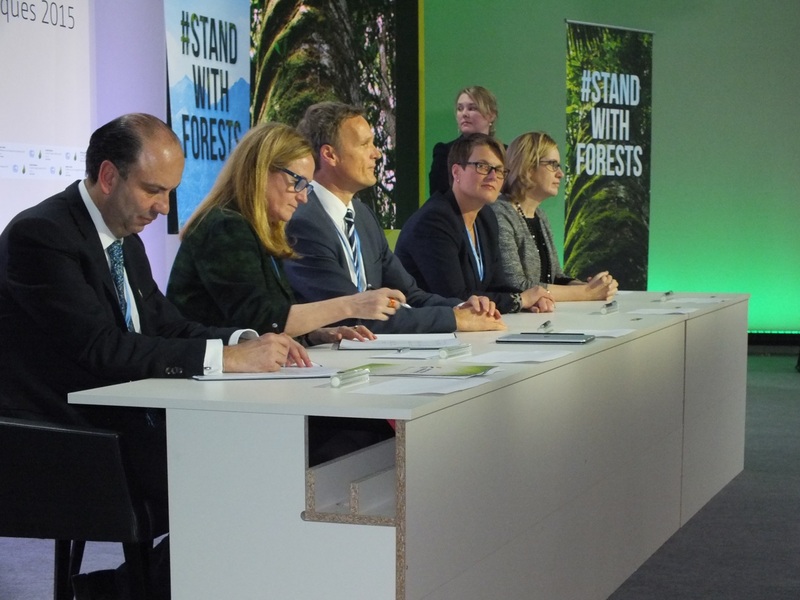 The first full day of the climate talks in Paris included a major announcement when Norway, Germany and the UK jointly pledged $5 billion to reducing deforestation in tropical forest countries over the next five years. 30 November 2015 | PARIS | Usually the United Nations climate talks start off rather slow, with technical and procedural discussions consuming most of the first week of the negotiations until presidents and prime ministers jet in towards the end of week two. 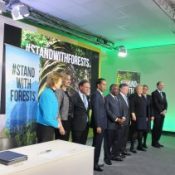 But the 21st Conference of the Parties (COP 21) to the United Nations Framework Convention on Climate Change (UNFCCC) is already proving to be different, with heads of state coming together on Day 1 of the talks for a major announcement for forests. 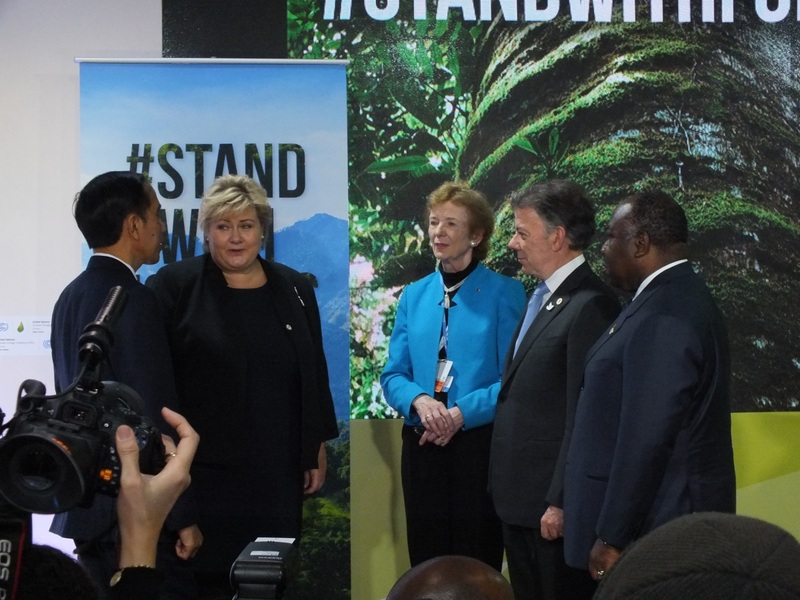 At a press event today, Norway, Germany and the United Kingdom entered into a joint agreement pledging US $5 billion to reduce carbon emissions caused by tropical deforestation, known as REDD+ (Reducing Emissions from Deforestation and Forest Degradation) under the UNFCCC. The countries intend to shell out around $800 million per year starting in 2015, with finance reaching $1 billion per year by 2020. “We’re here to witness an extraordinary and diverse group of world leaders affirm their political will for strong, collective and urgent action to reduce greenhouse gas emissions from forests through partnerships that put people right at the heart of action on climate change,” Mary Robinson, the UN’s Secretary General’s Special Envoy on Climate Change, said during a press event at the COP. $339 million from Germany, Norway, and the UK to the FCPF Carbon Fund. The breakdown is: $135 M from the UK, $146.7 M from Norway, and $57.2 M from Germany, subject to budgetary and parliamentary approval. More than $100 million from Germany, Norway, and the UK to Colombia through the REDD Early Movers Program (REM). The breakdown is: $48 M from the UK, $53.3 M from Norway, and $12 M from Germany. Continued support from Norway to Brazil’s Amazon Fund “at around current levels up to 2020”, if Brazil continues to reduce deforestation. Norway’s payments into the Amazon Fund over the last three years have been: 1,000 NOK (US $115 million) in 2013, 900 NOK (US $103 million) in 2014, and 1,025 NOK (US $118 million) in 2015. Today’s announcement is a significant policy signal placing high-level importance on forests in the plans to fight climate change, Robinson said. Governments have been working for years to advance the REDD+ and broader forest agenda at climate talks. Steven Schwartzman, the Senior Director of Tropical Forest Policy at the Environmental Defense Fund, agreed. The $5 billion in new finance is framed as a “pledge” in a continuing shift towards payment-for-performance agreements in which tropical forest countries receive REDD+ payments only if they meet the terms of the agreement, which may include implementing certain readiness activities or achieving and verifying emissions reductions, quantified in tonnes of carbon dioxide equivalent (tCO2e). For example, in Norway’s payment-for-performance pledge to Liberia signed last year, $70 million is for readiness activities and $80 million is for verified emissions reductions. In Norway’s agreement with Peru, the breakdown is tipped more heavily towards payments for emissions reductions: $200 million available after 2017, versus $40 million for readiness before then. The recent flurry of public sector payment-for-performance agreements is a major shift documented in Ecosystem Marketplace’s State of Forest Carbon Finance 2015, released this month. Developed country governments have paid a total of $1.1 billion for REDD+ verified emissions reductions since 2009, mostly through Brazil’s Amazon Fund. Today’s $5 billion pledge indicates that these type of public sector results-based payments for REDD+ – which occur outside of traditional carbon markets – may be scaling up quickly. Though the agreement does not specify a target number of emissions reductions, some information on the potential financial flows can be deduced from previous agreements. For instance, the $339 million pledged to FCPF’s Carbon Fund will fund five new emissions reductions programs and nearly double the $465 million previously in the Fund. So far, eight countries – Chile, Costa Rica, the Democratic Republic of Congo, Ghana, Mexico, Nepal, Republic of Congo, and Vietnam – have signed letters of intent with the Carbon Fund for up to 90.4 MtCO2e in emissions reductions. Guatemala, Indonesia, and Peru are also in the FCPF pipeline, and investors have signaled that they’re willing to pay around $5/tonne. In the joint agreement, Norway, Germany, and the UK also indicate that they want to “partner with the private sector to transform supply chains to become deforestation-free, and leverage hundreds of billions of private investment in forests and agriculture.” Recent research from Ecosystem Marketplace’s Supply Change initiative shows that nearly 300 major commodity companies – including household names such as Walmart, L’Oréal, Danone, McDonald’s, and General Mills – have made commitments to purge deforestation from their often long and complicated supply chains. Gustavo Silva-Chavez, a longtime COP analyst and Program Manager at Forest Trends’ REDDX initiative (Forest Trends is Ecosystem Marketplace’s publisher) welcomed the announcement today, saying it incites more private sector involvement, which is badly needed. According to new data from REDDX, private money accounts for only 10% of forest finance in the 13 key tropical forest countries that the initiative tracks: Brazil, Colombia, Democratic Republic of Congo, Ecuador, Ethiopia, Indonesia, Ghana, Liberia, Mexico, Papua New Guinea, Peru, Tanzania, and Vietnam. Silva-Chavez said REDD+ will require much more private sector finance in order to ramp up and be successful. This new $1 billion per year, added to the current $10 billion in REDD+ pledges, is still far short of the estimated $20 billion a year we need to cut deforestation by 50% globally, he wrote in a blog post. According to Schwartzman, acquiring the bulk of that finance will require robust carbon markets for REDD+ offsets. “Until those markets exist, public funding has to make up part of the gap, and we just saw that happen here,” he said. In 2014, voluntary market actors spent $63 million on 16.1 MtCO2e in REDD offsets sourced from 41 different projects, according to the State of Forest Carbon Finance 2015. No compliance carbon market currently includes REDD+. Kelli Barrett is a freelance writer and editorial assistant at Ecosystem Marketplace. She can be reached at kbarrett@ecosystemmarketplace.com. Allie Goldstein is a Senior Associate in Ecosystem Marketplace’s Carbon Program. She can be reached at agoldstein@ecosystemmarketplace.com.